Comment: God covenanted with Abram/Abraham to make him exceedingly numerous, and the father to many nations. Abraham was a faithful follower of God and his righteousness was rewarded, as was his wife Sarai/Sarah’s faithfulness, too. Despite age and barrenness, both would become parents and out of their offspring nations would grow and prosper, bringing forth kings and princes. This story is the first introduction of the tribes of Israel from which the world’s nations grew. 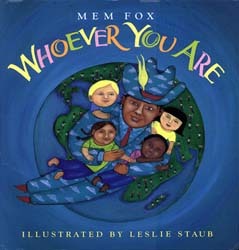 Mem Fox’s book Whoever You Are speaks to the connectional nature of all of God’s children; it is the story of our similarities and differences with a repetitive statement that everyone is “just like you.” Fox speaks to children and adults reminding us that although parts of our lives may be very different from one another, “…inside, their hearts are just like yours, whoever they are, wherever they are, all over the world.” This is important for us to remember in reading the story of Abraham and Sarah since this story of promise and blessing speaks to them being the father and mother, ancestors, of multitudes. Often when we read the covenant story we focus on the miraculous blessing God gives in the midst of our skepticism and even laughter. This unique twist helps us to focus on the story’s aspect of many from one and all being God’s children through promise, even when we may live different lives. In verses 7-8, God says to Abraham, “I will establish my covenant between me and you, and your offspring after you throughout their generations, for an everlasting covenant, to be God to you and to your offspring after you. And I will give to you, and to your offspring after you, the land where you are now an alien, all the land of Canaan, for a perpetual holding; and I will be their God.” God is central in this story; God is our common thread, despite being one of a multitude. a greater promise with a greater understanding of love for the wellbeing of all. The faith of the little girlthat creation wasn’t as it should have been lead to the restoration of humanity for the good of all of creation. Comment: Mark’s understanding of Christology and discipleship is one of participating with Christ. It means taking upon oneself some of the very same realities that Christ took upon himself. We see that Christ reveals himself deeply to his disciples and even rebukes them for their failure to understand or accept the revelation. When asking “who do you say that I am?,” Mark sees that Christ expects his followers to understand that being the Christ, and participating with Christ, means a death sentence – literally or figuratively. Mark’s gospel even ends with a desertion of Christ by his followers, although Christ has never given up on his followers. Mark requires Jesus’ followers to accept suffering, deny the self and follow Christ. Similarly, Horton gives himself up for the purpose of helping, and ultimately saving, the Who’s in Whoville. Through Horton’s quest to save this entire population that lives on a tiny speck of dust, first from destruction by nature and then by outsiders who don’t believe the savior, teaches us that “a person’s a person, no matter how small.” Horton sacrifices reputation and self for the sake of others, even risking his life to save the life of others. Horton, who recognizes the value and necessity of life, willingly denies himself and figuratively takes up Christ’s cross to follow, even to the point of potential death for the purpose of saving a life. The Lectionary Links this week are written by Union Presbyterian Seminary alumna Katie Barrett Todd of Lincoln, NE. Lectionary Links: Sunday, March 1, 2015 by Storypath is licensed under a Creative Commons Attribution-NonCommercial 4.0 International License. Lisa, Mem Fox’s book is a relatively short read and would work very well in a children’s sermon. Horton Hears a Who and Old Turtle are both longer books, but very valuable. They could be used in piece, summarizing part and then reading part aloud from the book, or they could just be summarized in a sermon or another part of the service. You could also use refrains from the books in prayers or as a benediction, too. I would say that Mem Fox’s book should take about 4-6 minutes to read aloud with showing pictures, and the others might be closer to 10-15 minute books. Hope this helps, some!